The project included realignment of the road, construction of 5 tunnels with total length of 7.12 km, 78 culverts and 2 bridges. The total contract amount was 275.06 million US dollar. The achieved progress on this project is 4% ahead of the scheduled progress. 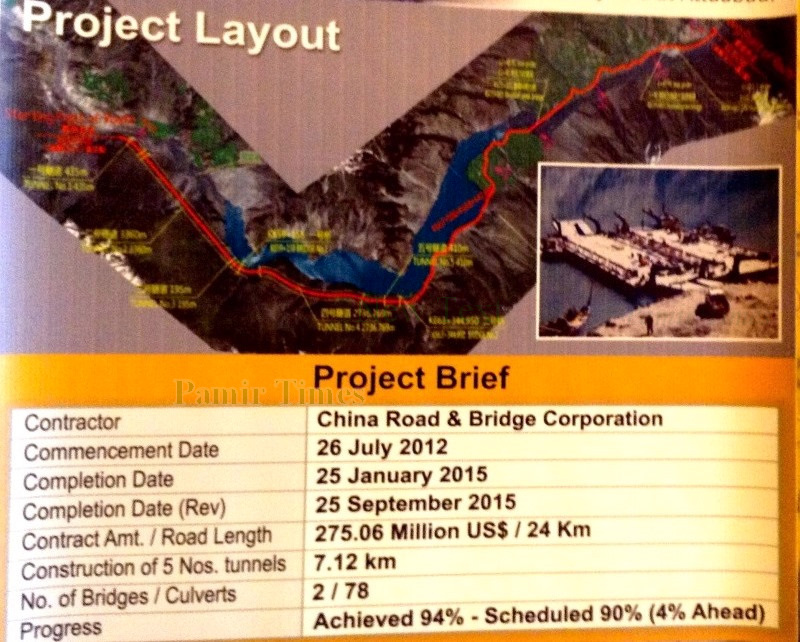 Hunza, June 27: The China Road & Bridge Corporation (CRBC) has completed 94 per cent of the work on the re-alignment project of the strategic Karakoram Highway (KKH), which will soon restore the trade link between Pakistan and China. Work on the remaining part of the project is in full swing and it will be completed by 25th September 2015. 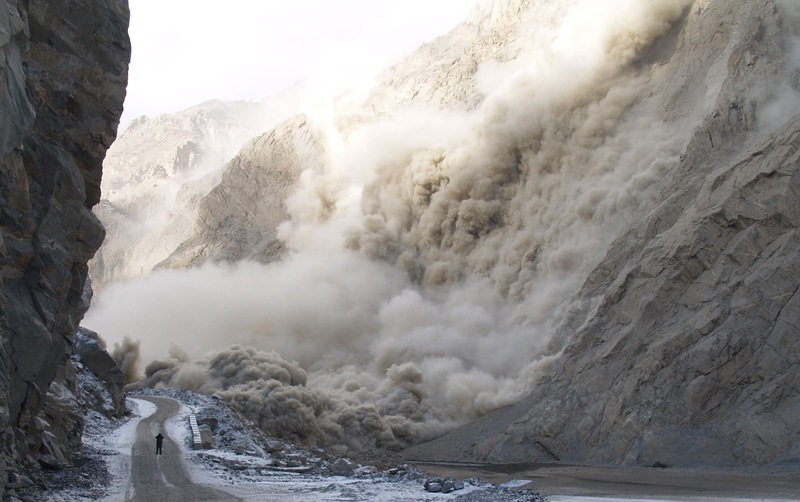 On 4 Jan 2010, a devastating landslide completely blocked the Hunza River and the strategic Karakoram Highway (KKH), a vital trade link connecting the country to China, and killed twenty people in Attabad village, about 18 km from Aliabad town. The water blockade created an artificial lake with 130-200 m depth and 25 km length over a period of about six months. The lake engulfed about 24 km stretch of KKH, including the longest bridge. About 25,000 habitants of the Gojal tehsil at China border area were cut off from rest of the country. The lake submerged Ayeenabad, parts of Shishkat, Gulmit, lower Ghulkin and Hussaini villages and displaced more than 600 families. The only way to reach Gojal tehsil and onward to the Chinese border is to cross the Attabad lake by boat. To realign the 24 km stretch of KKH, the previous federal government signed a supplementary contract of 275 million USD with CRBC on 18th December 2010. The project included realignment of road, construction of 5 tunnels with total length of 7.12 km, 78 culverts and 2 bridges. The total contract amount was 275.06 million US dollar. The project was commenced on 26th July 2012 with the planned completion date of 25th Jan 2015. Due to slower progress, the completion date was later revised as 25th September 2015. According to NHA, the current achieved progress on this project is 4% ahead of the scheduled progress. Under this project, the excavation works of all 5 tunnels have been completed hundred per cent. The remaining 100 m of the lining work of the 4th tunnel (2,736m) is in progress whereas the lining work of the remaining 4 tunnels have been completed fully. Similarly, 50% work of the concrete pavement of the 4th tunnel has been completed so far whereas the concrete pavements of the remaining 4 tunnels have been completed hundred per cent. The electro-mechanical accessory works on all five tunnels are in progress. According to NHA, CRBC has already completed the 311 km length KKH Improvement project from Raikot to Khunjerab on 30th November 2013 with a contract amount of 490.87 million USD. The project was started on 1st August 2008 and included improvement and widening of existing road, construction of 35 new bridges, 18 open cut tunnels and 1,060 culverts. Under KKH projects, 21% work on 36.94 km Shatial-Thor Nullah Bypass project has been completed so far by the contractor HAKAS Private Limited. The project was started on 23rd Sep 2012 with contract amount 3.507 billion rupees. The original date of completion was 23rd Sep 2014 which was later revised as 22nd May 2016. The 281km Thakot-Raikot Chinese Grant Project was contracted to M/s China Railway 17th Bureau Group Co., Ltd. The project was commenced on 15th September 2013 and has planned to complete by 20th December 2016. This includes 143 km rehabilitation work and 138 km repair and maintenance of KKH. The project costs approximately 7.5 billion rupees. 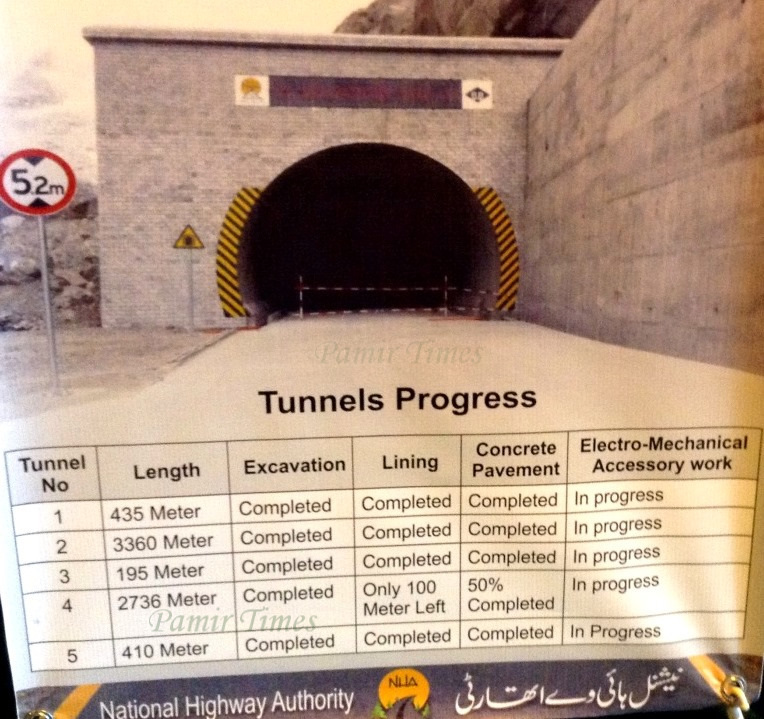 According to NHA, 65.11% of the work has been completed and the achieved progress is 5% ahead of planned progress. The 120 km long China Pakistan Economic Corridor (CPEC) Section from Thakot to Havelian will cost 90 billion rupees. RFP has been issued on 15th June 2015 with the last date for bid submission is 15th July 2015. Evaluations will be completed by 25th July 2015 and signing of the commercial contract is planned as 20th August 2015.The expected date of the ground breaking is 20th September 2015. The 59 km Hazara Expressway project from Burhan to Havelian will cost 23 billion rupees. The project is four lane fenced expressway with six interchanges. The project is being implemented in 3 different packages. The package 1 & 2 in in progress with 6% progress and the package 3 is under procurement phase. The planned completion date of the Hazara Expressway project is 5th March 2017. The Karakoram Highway is the highest paved international road globally and connects Xinjiang province of China and Gilgit–Baltistan of Pakistan through the Khunjerab Pass, at an elevation of 4,693 metres. The Highway construction was started in 1959 and completed in 1978. According to FWO, the work involved 21 million cubic meter of rock blasting and earthwork, using over 8000 tonnes of explosive and 80,000 tonnes of cement. On the average 15,000 men, 1200 vehicles and 1000 pieces of plant/machinery were employed on the project. The project took lives of hundreds of laborers and engineers from both Pakistan and China. 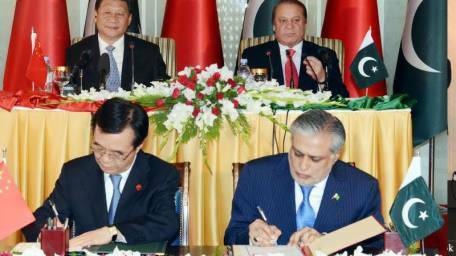 As a strategic move, Pakistan and China signed an agreement on the $46 billion China–Pakistan Economic Corridor (CPEC) project on 20th April 2015. CPEC is a development megaproject which aims to connect Pakistan’s southern port of Gwadar to China’s Xinjiang province via a network of about 3,000 km highways, telecommunication infrastructure, railways, industrial zones and energy infrastructure. The economic corridor is considered central to China–Pakistan relations and a game changer in regional development.